Did you know that Valletta is the European Capital of Culture for 2018? This is a status given to a city to celebrate its unique culture, and a chance to regenerate its culture to compete on an international level. Valletta attained this remarkable bid on the back of a massive City Gate regeneration project and riding on the wings of lofty promises regarding our arts and culture growth, both in Valletta and on a larger national scale. It’s all very nice. So nice, in fact, that a budding artist created a stencil of a man and a woman whose outstretched arms form a heart, and, free of charge, gave it to the Maltese people, simply and powerfully rendered on the entrance to Valletta. Upon entering Valletta, one would casually be greeted with a declaration of loving intent, an offhand statement about virtue. The stencil was found at 4 am this morning. By noon, it was already being removed. The promptness and decisiveness of the action to remove it reveals the underlying values of our cultural authorities, these Svengali who preach and praise culture and the arts when performing in the public domain, then immediately dismiss any form of art that they have not had a hand in blessing. One can easily argue that this is a piece of vandalism, and as such, is unlawful and needs to be processed diligently; so diligently that it need be dealt with in less than eight hours. If only we dealt with the vandalism of our environment as zealously. Forget eight hours – we could stop the legal ‘development’ of Wied Il-Għasel in Mosta, for example, in under an hour, and spend the next seven just chilling in the green. Sounds perfect. I’ll bring the picnic basket, you get the wine – let’s get crunk. 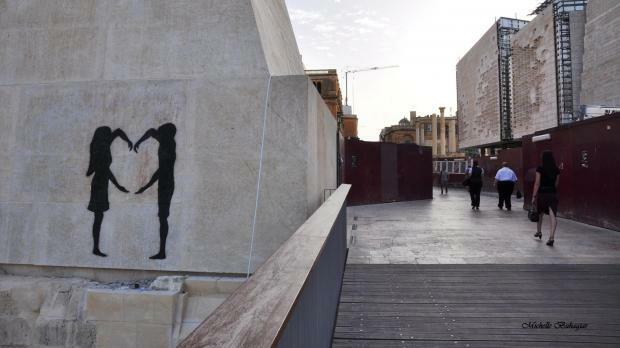 While some local councils, like those in Sliema, Gżira, and San Ġwann, actively seek out and fund street art, to brighten up the drab and emotionless crap we refer to as concrete walling, Valletta’s council, as the supposed epicentre of culture in Malta, not only removes street art at a pace to rival Usain Bolt, but then undertakes a police search for the artist to face criminal penalties. In places like London or Bristol, street art is treated with a certain reverence, a way of turning the bland street bloom into a public viewing gallery. Pieces by artists like Banksy are even preserved and protected, at cost to the local councils. Not to say that a lone black stencil is comparable to work by someone like Banksy…but a country has got to start somewhere, non? Whether or not the piece of work is ‘artistic’ enough for your taste is not important, mainly because no one cares about personal taste anymore. 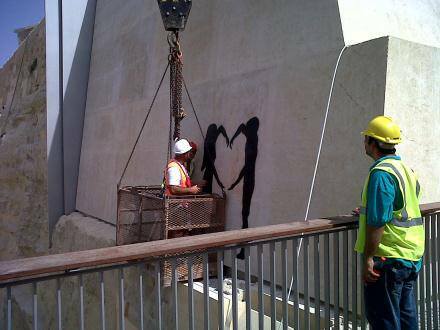 What is important is this – someone planned and successfully executed a subversive piece of art in a non-art context, unsanctioned by any authority, regarding the most powerful human expression; love. Instead of being celebrated, it was removed with chemicals. Welcome to Valletta, the bland: European Capital of Culture for 2018. PS: This was just found in Qormi. I do hope the relevant authorities have been informed, and a specialist squad has been dispatched to remove this eyesore. Keep the second slab with the piece on it, throw the rest of them away, and let’s get the process of beautification up and running, ASAP.